 Produces accurate automotive double & single flares on most common sizes of brake pipe. 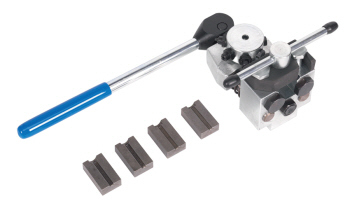  Cam-action body mounts in bench vice for ease of use.  Includes dies and clamp blocks for forming most popular flares. Dies DIN 4.75, 8mm, SAE 3/16"/4.75mm, 1/4", 5/16"/8mm, 3/8"
Clamp Blocks 4.75mm, 3/16", 1/4", 5/16"
The quick to rotate turret means you can change sizes in seconds.